"There's no snail soup," says Meryem Ameziane, disappointment in her voice. I'm trying my best not to look pleased. Snail soup is a winter dish in Morocco but in mid-May we're teetering on the brink of summer. I've been saved. 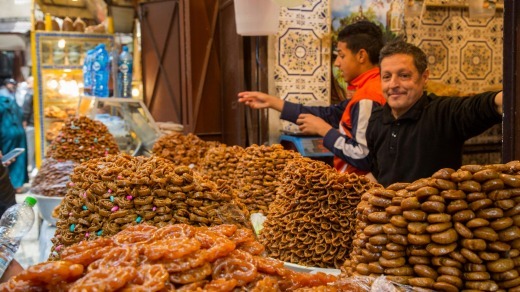 With a fresh spring in my step, I stride forth through the pulsing medina of Fez towards our next foodie adventure. 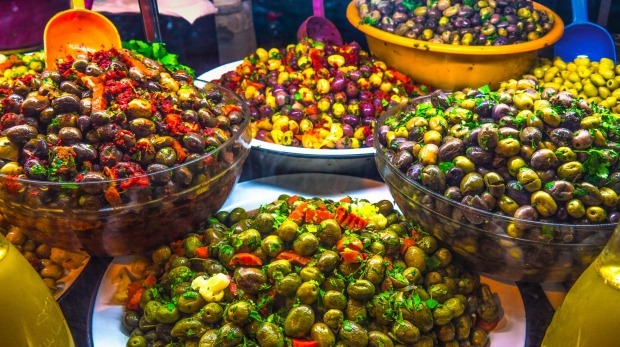 Fez is the mecca of food in Morocco, home of the finest traditional cooking, and Meryem Ameziane, of Plan-it Fez, is my guide on a four-hour food tour of the city's tangled medina, the old city. It begins with a tasting session in the honey market. Digging into deep plastic barrels, Ameziane hauls out treacly spoonfuls of thyme, fig, lavender, acacia, eucalyptus and finally euphorbia honey, which you can only take in very small quantities, with powerful medicinal properties. Next, chicken and meat from the head of a sheep, served with chilli sauce, and cheeses made from goat and a mild sheep's cheese, almost like a dry ricotta. The cheese man says they also make cheese from cow's milk but he's not a fan, it all tastes the same to him. There's a huge crowd around the sweet stall where we queue for triangular pastries dripping with honey and stuffed with almond paste. 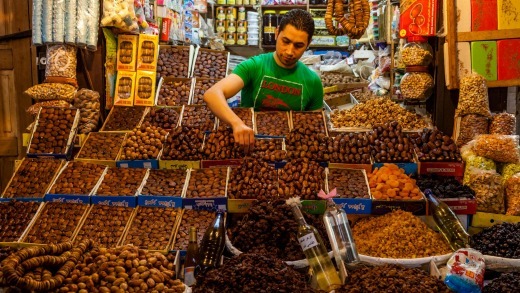 We sample dates from glistening piles, a Moroccan addiction, and they're delicious, especially the Medjool dates which sometimes come wrapped around a walnut. "What's this?" Ameziane asks us, holding up a dried flower head with stiff bristles clustered in a cone-shape. It's the toothpick plant, the dried umbrel of the Ammi Visnaga, known here as bushnika, originally from the Nile delta. Pull off a stem and you're on your way to clean teeth. Every neighbourhood has to have a hammam, a fountain, a mosque and a bakery, Ameziane tells me, and here's the bakery. Lit only by the fire within his wood-fired oven, the baker using a long paddle to shove bread about. It's a sociable occupation. Women come here with trays of biscuits to be baked. They sit and chat, and the baker gets all the local gossip. Traditionally he was the matchmaker. A man in search of a wife would ask the baker who was available, and whether she knew how to make good biscuits. We fold ourselves into a tiny tea stall where the tea seller works behind an elaborate copper urn. He's a character, theatrically beheading piles of aromatic herbs – geranium, sage, wormwood, orange blossom – but above all mint, and heaps of sugar, steeped in glasses and served boiling hot. It's important to serve tea at maximum temperature when you serve it to a friend. They'll hang around waiting for the tea to cool, and you'll have more opportunity for a chin wag, and Moroccans love nothing better. Next stop, a dark chamber where a man squats feeding wood chips into a giant pot-bellied furnace that heats the water in the hammam next door. It's a lonely life but there's a rooster in there with him, "for company" Ameziane says. A woman appears at the door in a dressing gown. "It's not hot enough she tells him, do your job." "It's as hot as I can make it," he says, a man used to being nagged. There's a famous dish known as a tanger, meat, olives and preserved lemons, slow cooked in a cast iron pot in the hot coals from the hammam fire. Traditionally a man would drop off his tanger on the way to work and pick it up on the way home. It's growing dark when we step outside, and Ameziane says her farewells. She's heading home to cook dinner for her husband. "Snail soup?" I ask? "No," she says wrinkling her nose. "He doesn't really like it." Michael Gebicki travelled to and around Morocco at his own expense. Qatar Airways operates direct flights from Sydney, Melbourne, Perth, Brisbane, Adelaide and Canberra to Casablanca via Doha. This is the only airline that also operates a direct flight between Marrakech and one of the Gulf States, a convenient option for travellers looking to enter Morocco at Casablanca and exit from Marrakech. 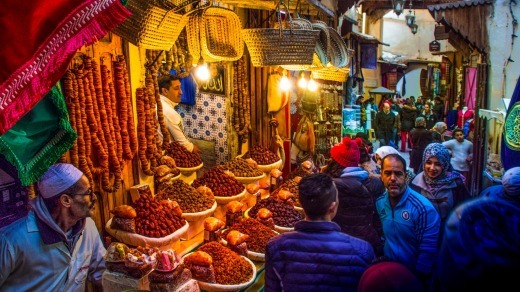 Plan-it Fez has several culturally immersive tours of Fez and throughout Morocco, including several food tours. 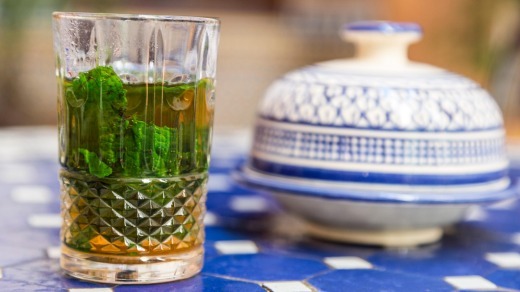 Le Jardin des Biehn is a former governor's house now converted to a small hotel with a luscious garden as its centrepiece, a rare find in the crowded medina of Fez. The owner is an antique dealer and decor consists of antiques and objets-d'art from exotic corners of the globe, against splashy backdrops. The restaurant is quiet and relaxing.